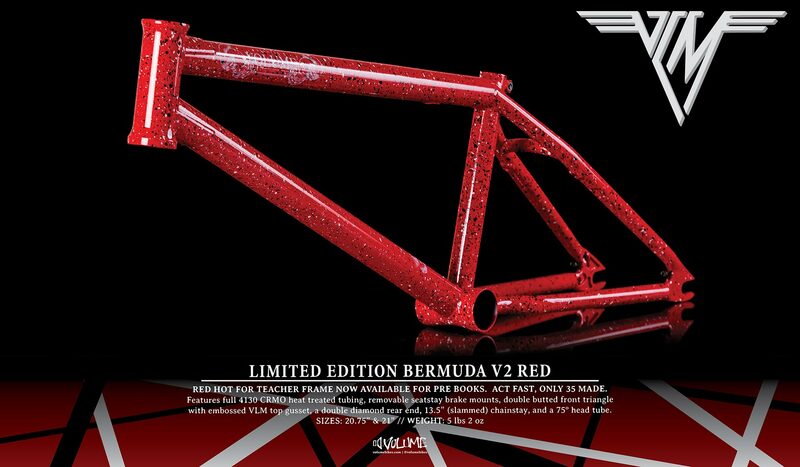 Very limited edition of 35 red hot for teacher Bermuda V2 frames are now available for pre-book. They arrive next week and since they’re first come first serve, we wanted to give you guys a heads up a week in advance. 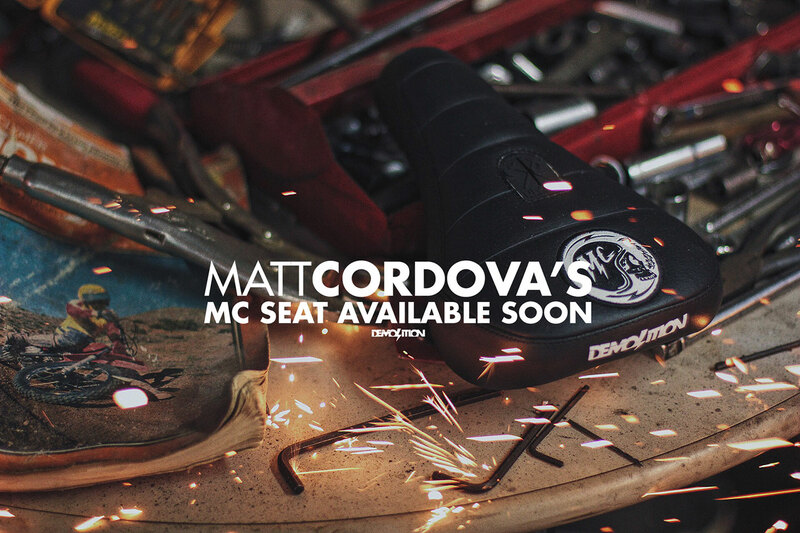 If you’ve been waiting for the Matt Cordova signature Demolition MC Seat to drop and wondering what happened, then you’ll be pleased to hear that they’ll be dropping next week. There was a little delay due to a material problem on the first batch and that made them just not up to par on what both Matt & Demolition wanted, so we the tough decision was made to get them re-done. Well, after that short delay we’ll be seeing them next week. Designed as a fat seat & after Matt’s favorite motorcycle seat with ribbed top & Cordova Signature MC Skull patch, they’ll be available in pivotal & tripod. Hit us up now to get one pre-ordered, & check out Matt’s signature Demolition shirt that just dropped. Be on the look out for Matt’s seat promo from Demolition also. Today is the last day to get up to 10% off and Free Shipping off your entire 180 Dist. order of Volume & Demolition goods. Orders over $200 get 10% and orders over $500 get 10% off & Free Shipping. And, the only items excluded are clearance and sale items. So yes, all the new Vessel V2 & War Horse frames, Anchor V2 & Fox forks, Broc & DeMarcus & Fernengel seats, etc from both brands are included. Discounts are taken on the backend when your rep processes the order and HI & AK are excluded from Free shipping (enquire for these specials). Photo from Volume Bike’s Memorial Day Vessel V2 build. We’ve only got less than a week left on our current specials going, and all of the brand new Volume & Demolition products that just dropped are INCLUDED. Get 10% off your orders of $200 or more, OR get 10% off and FREE SHIPPING on your orders of $500 or more*. The only items excluded are items already tagged “clearance” or already on sale, but Broc’s new Vessel V2, Anchor V2, & Nautical V2, and DeMarcus Paul’s new War Horse Frame and War Horse Seat are included. Broc Photo above shot by J.Cobbs. *Ends May 31st. All discounts applied after order processed. Free shipping excludes HI & AK; inquire for these shipping discounts. The highly anticipated Demolition Parts Slider Front Hub Guards are finally in stock and they’re living up to everything we hoped they would be. After a couple years (no kidding) of refining, testing, and dialing in the PC/Nylon compound, adaptability, durability, and longevity we’ve finally got them where we want them. They’re inexpensive, sold individually and come in three options: PC Guard only, PC Guard+Bulimia Cone, or PC Guard+Ghost Cone. 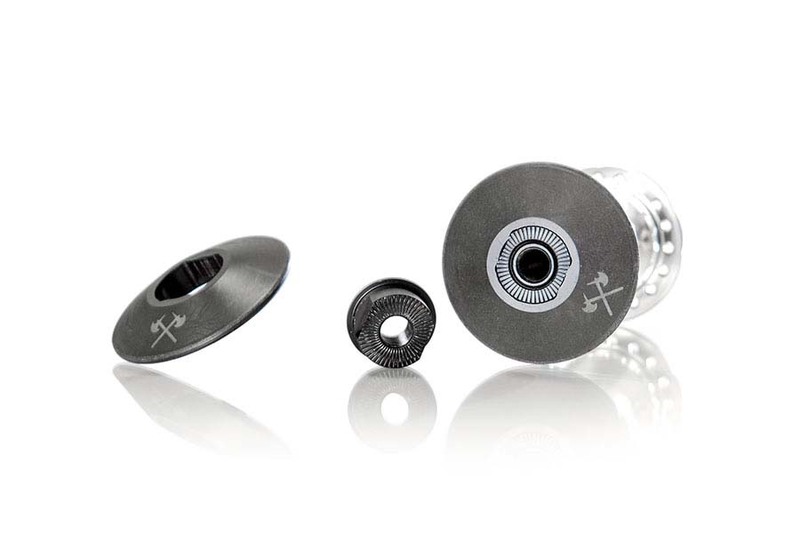 All Bulimia V3 hubs and Ghost V2 hubs come with the newly designed cone the PC slides on top of. For V1/V2 Bulimias & V1 Ghosts you’ll need to get the PC with the new cone to retrofit your hub. We’re sure they’re fit other brands’ front hubs on the market too, but haven’t specifically tested any to guarantee that, so know that before you try it, and if you do try it, then please let us know. RIDEbmx just posted their “Know Your Roll” Wednesday feature and this week it’s all about DeMarcus Paul’s brand new Volume War Horse frame. Personally, I love this frame. I can’t get enough when looking at the matte rust colorway (part of that might be because my last name is Rust). And the spec’s are so modern and tech that I just feel like DeMarcus really did a good job when making this frame a reality. Hit the link to check out RIDEbmx’s write-up and keep a look out for more DeMarcus footage & interviews in the near future. 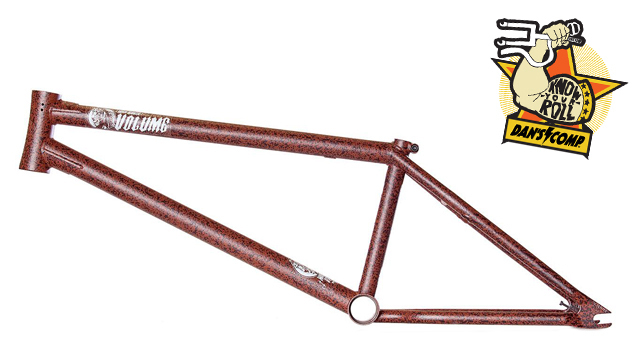 Lastly, check out the matching Anchor forks (out now) and War Horse bars (only a month away). 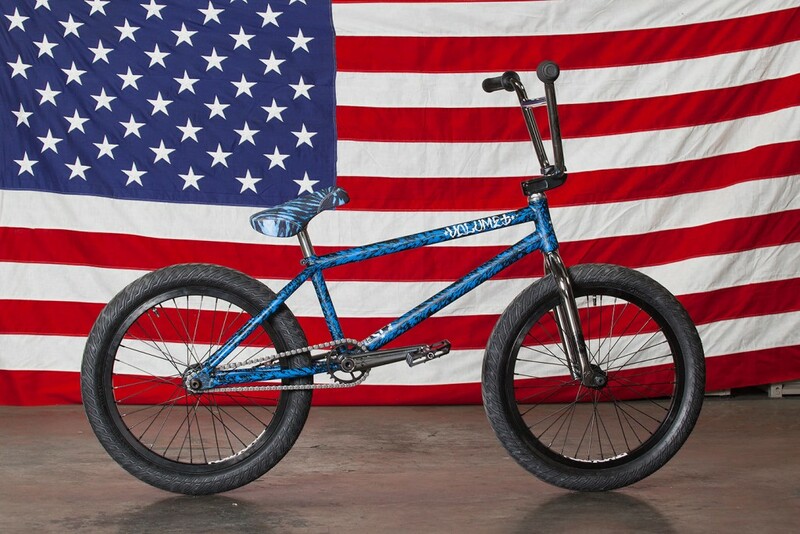 RideBMX just posted a new “What I Ride” bike check with Volume’s Pro Broc Raiford. He just built up a completely new set up and it looks so good. I never thought I’d like the look of gloss black again the BMX Industry’s switch to flat years ago, but dang this looks fresh. Here’s what RideBMX had to say, and check out his Pro Part from last week full of ridiculous clips…. Don’t forget that this month we’re doing some crazy sales! 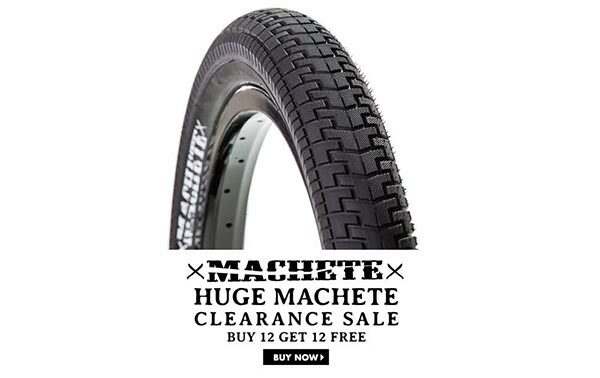 Demolition Machete tires are buy 12 get 12 free, and we’re doing FREE SHIPPING on parts orders over $300 (excludes AK & HI). We’re also doing 15% off the remaining Volume 2016 Completes in stock, and 30% off a bunch of seats and stems. There’s limited stock on a bunch of these and we’re only just over a week from the shipping special ending. Holy Crap! Volume pro Broc Raiford just keeps delivering. RideBMX just dropped his Pro Part today and it’s absolutely unreal. It also includes the clip from Broc’s Issue 209 cover. Film/Edit by Zach Krejmas. Broc Raiford filmed his Pro Part over the past year, starting around the time of his Pro Interview in issue 209 0f RideBMX Magazine. From Arizona to California, Broc brings power and grace, delivering a plethora of mind-bending moves big and small. From technical NBD’s to some straight up big-boy setups, it’s all here. Sit back, relax, hit play, and enjoy.